James Chan: Chen Din Hwa was born in Ningbo, China in 1923. His family were poor and he left school when he was 12 and became an apprentice to a silk merchant. When he was 22 he was already chief manager of his family business and owned several shops in Shanghai and Ningbo. In 1949, Chen’s family moved to Hong Kong. In 1954 Chen set up Nan Fung Textiles (later Nan Fung Textiles Consolidated Ltd) which became a successful cotton yarn producer. The company also developed interests in shipping. The company underwent a major reorganisation in 1969 when the Nan Fung Textiles Consolidated Limited came into being . In 1970, Nan Fung was listed on the Hong Kong Stock Exchange and became the holding company of three wholly-owned subsidiary companies, Nan Fung Textiles Limited, Nan Fung Textiles Second Mill Limited and Kin Fung Garments and Investments Limited, with a diversified portfolio of business interests. 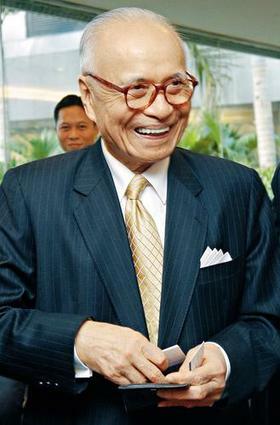 Chen transformed the privately held Nan Fung Group into a major property developer and shipping company. As a devout Buddhist, Chen founded the DH Chen Foundation, which provides charity services in education, welfare and medicine. He died on 17th June 2012. This article was first posted on 10th December 2014.